As US Secretary of State Hillary Clinton meets Russian Foreign Minister Sergei Lavrov for the first time on Friday, it is time for the new atmospherics to start being turned into new policies. 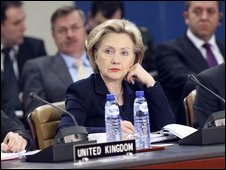 The meeting in Geneva follows a decision on Thursday by Nato foreign ministers - Mrs Clinton among them - to resume relations between Nato and Russia. These were broken off after the Russian action in Georgia last year. The Clinton-Lavrov talks will be followed by the first meeting between Presidents Obama and Medvedev on 2 April in London, where they will both attend the G20 economic summit. So, as Vice-President Jo Biden recently said it would be, the reset button on US relations with Russia has been pressed. Mrs Clinton has herself spoken of a "fresh start." What is likely to be written on this blank screen? The broad question is whether Moscow and Washington want to act as partners or as competitors. Relations between Russia and the West in general have deteriorated markedly over the last few years. Is this confrontational approach now to be ended? The answer is that things should improve but that it is not all going to be sweetness and light. These are some of the issues that have to be addressed. Missile defence is probably the toughest problem on the table. Mr Obama has reportedly proposed that a way out might be to get Russian help in stopping Iran from developing an inter-continental ballistic missile (ICBM). If there were no Iranian long-range missiles, the argument runs, there would be no need for missile defence, at least not in Eastern Europe where its planned deployment has upset Moscow. The difficulty with this proposal is that Iran seems intent on developing its rockets, even though it is some years away from an ICBM, and it is not clear how Russia might deter it. Reports from the US say the offer is tied to results, but Russia says this is not so. The basis for any arrangement needs to be clarified. So there is some prospect of progress but no guarantee. Here the two sides have more in common. Russia has so far been reluctant to impose further sanctions. The US seems ready to try talks with Iran to see if there is any flexibility in the Iranian position. Again, the problem is what happens if Iran simply digs in its heels. This could end up being a major crisis. 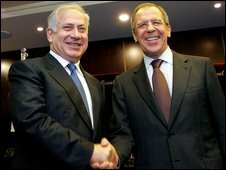 Israel has been warning that it will not tolerate a "nuclear Iran". However, does that mean an Iranian technical capability or an actual nuclear bomb programme, which Iran denies it has? The US would like Russia not to sell advanced anti-aircraft missiles to Iran. Can the cavalry head this ambush off at the pass? Mrs Clinton has proposed an international conference, to which Russia would presumably be invited. But a delicate balance of interests is in play. Russia would hardly want a Taleban regime in Afghanistan, but the US suspects Russia of being instrumental in getting the government of Kyrgyzstan to threaten to close the Manas airbase which is the major air hub supporting the Nato supply line into Afghanistan. Russia has indicated it will allow non-lethal cargo access through its territory, but details have to be worked out. Russia will have to resist the temptation of saying about Afghanistan: "We told you so." This is the most hopeful area for an agreement. Both sides have an interest in further reducing their strategic nuclear stockpiles and it looks as if negotiations will get under way soon. They need to. There is a deadline, as the old Start treaty runs out in December. That provided the legal basis of verification for other treaties and those measures need to be renewed. On top of that, there is talk of reducing missile warheads down towards 1,000 each. They are due to reduce to a maximum of 2,200 deployed warheads by 2012. The Russians also want not just deployed warheads but stored warheads to be counted and for delivery vehicles (rockets, bombers, submarines) to be reduced as well. The question here is whether or when Ukraine and Georgia will become Nato members. A year ago they were given a promise in principle but in practice it is going to be a long way off, especially for Georgia. Russia opposes membership for either. The conflict last summer showed how volatile that region is and Washington might not want to press this too hard, while not backing down on the principle. Has anybody got any new ideas on Middle East peace? Mrs Clinton has reaffirmed the US commitment to a two-state solution and Russia is on board with that, though it is as far off as ever. The US is also sending envoys to Syria to see if a new peace front could be opened there. Sighs of despair will probably echo across the table. As for counter-terrorism, Mr Bush's phrase "war on terror" has run its course, but cooperation will still be needed. Russia still fears Chechen-originated terrorism, so has an incentive to stay connected to the US and other Western countries on intelligence. But how far will this go? Britain has run into problems with Russia over the murder of the exiled Alexander Litvinenko, so there is still suspicion to be overcome. Will Russia accept US defence deal?